The QUIKRETE ® Companies recently joined The Home Depot Foundation and 250 volunteers to give American Legion Post 201 a much needed rehabilitation. “Chris Burden: Extreme Measures” Features Powerful Concrete Sculptures. Advanced Formula Stains, Sealers and Coatings Beautify and Protect Concrete Surfaces. QUIKRETE ® will award one randomly selected fan at each home game $1,000 for every first down the Atlanta Falcons gain on its opening offensive drive. Consumers can enter the sweepstakes for a chance to win a prize pack valued at $599. Base Coat Stucco Applied Over 200,000 Square Feet Through Silo System. Survey of Nearly 1,300 Homeowners Pinpoints Project Preferences. Authentic 80,000-Gallon Australian Habitat Created with Shotcrete. The brand advertisement uses lighthearted humor to compare the difficulties of repeated heartbreak with the ease of home improvement projects using QUIKRETE ® products. Contest Humanizes Damaged Mailboxes in Playful Public Service Campaign. Red Ranger Mortar Mix Used to Rebuild Backstop and Update Main Concourse Concessions. Polymer Modified Fiber-Reinforced Deck Mix Used to Refurbish Balconies. 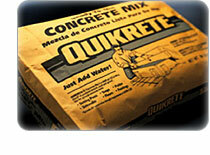 QUIKRETE ® Encourages Mailbox Repairs with Makeover Contest. Shotcrete Used on Alcatraz Island Facelift. The National One Coat Stucco Association (NOCSA) recently named The QUIKRETE ® Companies stucco products manager, Mike Griffin to its board of directors as president. Rapid Road Repair and FastSet™ DOT Mix Featured at Show. Expands Zip & Mix and Stucco Product Portfolios.